Media Inquiries. We welcome inquiries from members of the media seeking to report on the small house movement and trends toward simpler more sustainable living. Please contact us and a member of our support team will respond as soon as possible. Media Coverage – The Small House Society in the News. 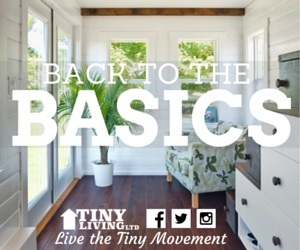 Recently, there has been significant media coverage of the Small House Society and the trend toward living in smaller spaces. Our work and that of our members has been featured by CNN, National Public Radio, the New York Times, Better Homes and Gardens, the Wall Street Journal, Time Magazine, and The Oprah Winfrey Show. Global News Coverage. 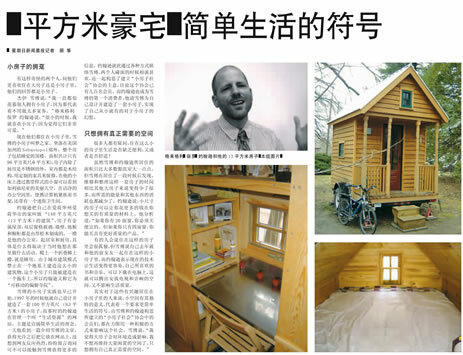 The Small House Society has been reported extensively by North American media and as far away as Australia and even China (see article above). A Diversity of Voices. Of course, no single person or house can alone represent the movement toward smaller, simpler, more sustainable living. For this reason we make an effort to provide a balance of books, news coverage, and other resources that can help convey a message of simpler living on any scale. Audio is now available for recent interviews with Gregory Johnson and other Small House Movement members. Small House Movement – Platz ist in der kleinsten Hütte, 9. März 2013. “In Ländern mit hohen Bevölkerungsdichten wie Japan oder hohen Grundstückspreisen wie die USA gibt es natürlich mehr Minihäuser als anderswo. In den USA ist auch die Heimat der Minihausbewegung angesiedelt. In der Small House Society machen sich Menschen Gedanken über Entwicklung und Nutzung kleiner Häuser, zum Nutzen aller Interessierten.” Translation: In countries with high population densities, such as Japan or high land prices as the U.S., there are of course more mini houses than elsewhere. In the U.S., the the mini-house movement is based. The Small House Society is to make people think about development and use of small houses, for the benefit of all stakeholders. Sustainable Home Day, ABC News Radio Canberra Australia, Interview with Gregory Johnson, 10 September 2011. This recorded-live-interview with ABC Radio News Canberra Australia was on 10 September 2011 (11 September 2011 in Australia) as a part of the Sustainable House Day event. Below are links to some of the television media and online videos that featured the Small House Society. IMBC Television Korea. An extended documentary about the small house movement aired in Korea on Friday, 4 March 2011. ABC News, Good Morning America, 19 July 2007. Dee Williams was interviewed on Good Morning America. The video is now being featured across the Internet including the main page of Yahoo. The Oprah Winfrey Show. Jay Shafer, one of the Small House Society co-founders, appeared on the Oprah Winfrey Show which aired Tuesday, February 20, 2007. The Oprah.com website has declared: “This Is the Year to Declutter Your Life.” The site has numerous stories with tips to help people declutter their lives – the first step to smaller and more effective living. Another Tiny Home on Wheels. “Positive change begins at home. So when Dee Williams decided to change her life, that’s where she started. In fact, she redefined what “home” meant, right down to what it was, and where it could go.” A film by Mark Hoffman. You can also view the following video at Nau.com (very nice quality) or on Yahoo Video. PBS Affiliate WQPT featured Gregory Johnson and the Small House Society. Click here to view the video now. CBS affiliate KCCI Channel 8 in Des Moines Iowa featured a story about Small House Society Coordinator, Gregory Johnson and his home The Mobile Hermitage. 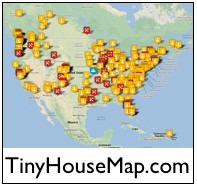 Below are just a few samples showing media coverage of the Small House Society. Newsmax Maxlife Magazine, “Home Sweet Home – Downsizing into tiny houses becomes a big new trend,” October 2011. Available in print only. Associated Press, “Tiny house movement thrives amid real estate bust,” 29 November 2010. “…Gregory Johnson, who co-founded the Small House Society with Shafer, said the online community now has about 1,800 subscribers, up from about 300 five years ago.” This article was distributed through ABC, CBS, MSN, NPR – National Public Radio, Yahoo, and over 60,000 other news outlets. 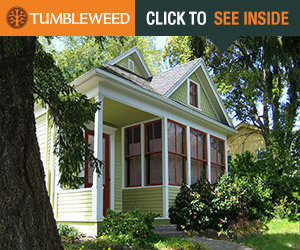 GAIA Magazine, August-September 2008, “Tiny Houses – Living Well by Living Small” by Jordan E. Rosenfeld, pages 34-37.
Business Week – Hot Properties. This April 16, 2007 article from Business Week highlights the benefits of smaller living.